Are you a fan of Booktube? In the recent months, I have watched & read some controversial things about the world of 'Booktube.' However, it's still a guilty pleasure of mine. What can I say?? I just can't quit it! I have noticed though that my favorites have changed a bit over the past few months. I still watch some of the original Booktubers that I listed in my last post (HERE) but for the most part, I have an entirely new groups of book enthusiasts that I divulge in nowadays. Richard of BOOKSANDBULLSHIT is at the top of my current favorite Booktubers. His appreciation for the local library has encouraged me to put the ole' library card to use once again. I also have to give Richard props for always keeping his videos real. I may not always share the same views as he does on particular books but his realness earns major respect from me. The video I'm sharing from Richard's channel was the first that I ever watched from him. It's where it all began. I highly recommend giving it a watch & then heading over to subscribe to his channel. Peter of Peter Likes Books is nothing short of hilarious. His personality is off the charts & never fails to bring a smile to my face. I just recently started watching his videos but he has quickly made his way to my top all-time favorites. With a knack for encouraging others to be themselves & overcoming their fears of starting their own booktube channel, I love this guy! Check out Peter's list of recommended Summer Reads! I promise- he will not disappoint. And all it takes is just one watch & you'll be hooked! Paige of Paige's Pages is new to my subscription list. Her videos are light and wonderful. Nothing too over the top & perfect when I'm in the mood for a relaxed video about books. Her taste in books seems to be similar to mine in many areas & I think I've found another booktuber that I'll be a fan of for the long haul. The first video that I had the privilege of watching by her was her collaboration of sorts with Richard (from BOOKSANDBULLSHIT). Her opinions on lack of diversity in ya books was pretty spot on. What are you waiting on? Go ahead & watch it! Amanda from the channel Amanda Center is a wonderful booktuber who I stumbled across a few weeks ago. Her soft spoken nature is a nice change of pace & I love that she recommends a lot of books that not many others are talking about. Even though I am new to watching Amanda's channel, I highly recommend checking her out. Watch the suggested video below to hear about her personal Booktuber recommendations. Katie of ChapterStackss is a Booktuber with quite a bit of subscribers. Her videos cover reviews, discussions, book hauls, & other things book related or not. I have been a subscriber of hers for quite a while & still, I enjoy her videos. Check her out! The video I am sharing below is Katie's Disappointing Books video. She handles this topic with grace & manages to share her disappointments well. If you enjoyed this list, be sure to check out '5 Booktubers that I Love'. Are you a fan of Booktube? 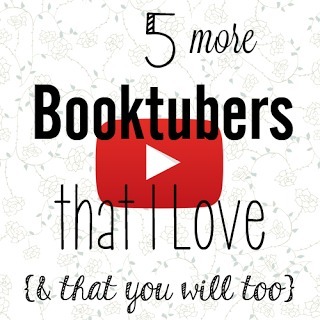 Are you a Booktuber that I'd love to watch?